Every student in St. Louis deserves an excellent teacher. Join us as we expand opportunities for our students and our city. Today, educational inequity persists in the St. Louis region along racial and economic lines. We believe that excellent teachers can dramatically impact the lives of the students, families, and communities that they serve. In 2016, 72% of St. Louis public school students graduated from high school. St. Louis Teacher Residency takes a different approach to teacher education. As a resident, you’ll spend one year working with an experienced mentor teacher in a high-needs classroom, developing the skills you’ll need to be a leader in the classroom. You’ll also take classes with us focused on the core competencies you’ll need to have a successful career in teaching. By joining STLTR, you make a commitment to serve the students and families in St. Louis public schools. Through our innovative residency model, we commit to giving you the most effective pathway into a career in urban education. 25% of St. Louis Public School students perform on grade-level in Math. 7 miles away, in the Brentwood School District, 79% of students are proficient. Applications are now open for our 2019 cohort! We are looking for passionate learners who are ready to make a difference in our community. Do you have what it takes to be a leader in the classroom? Since the integration of public schools in America, over 60% of residents have left the city of St. Louis. 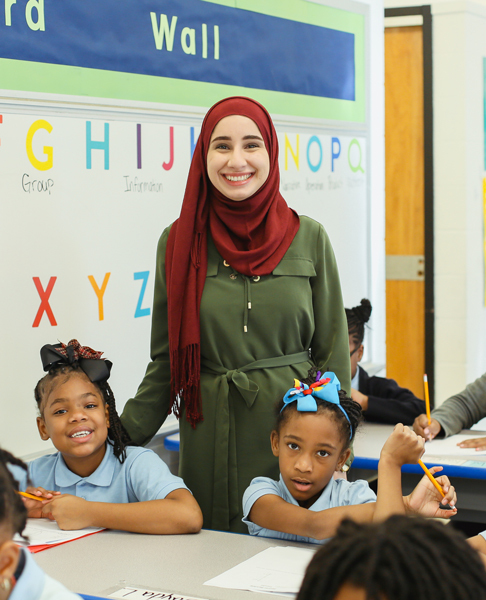 St. Louis Teacher Residency has established partnerships with traditional public school districts and charter schools throughout the St. Louis region. Residents will be placed at one of our 10 partner schools, developing and practicing with one of STLTR’s experienced, mentor teachers.